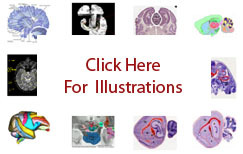 The term supraoptic nucleus refers to a group of cells in the anterior hypothalamic region at the ventral and lateral extremes of the hypothalamus. It is demonstrated by Nissl stain in the human ( Mai-1997 ), the macaque ( Paxinos-2009a ), the rat ( Swanson-2004 ) and the mouse ( Hof-2000 ). Located close to the optic chiasm and optic tract, it is composed of two parts, the dorsolateral part of the supraoptic nucleus and the retrochiasmatic part of the supraoptic nucleus. Functionally it belongs to the subcortical motor system ( Swanson-2004 ). Some authors regard the retrochiasmatic area, which is relatively small in the human, to be a 'tuberal part' of the supraoptic nucleus, not a distinct entity ( Mai-1997 ).